This article is an excerpt from our latest release, The SEO Business Guide. The entire chapter from which the article is drawn, along with two other chapters, is available as a free PDF download. Itâ€™s well worth checking out if youâ€™re interested in learning more about conducting effective and best-practice SEO.Both Google and Bing offer a webmaster dashboard that gives insights into activity by the search engine on any site that has been registered and verified via the dashboard.These dashboards present a number of tools and insights to data unable to be gleaned by any other method. They provide the only way to gain an understanding of how the search engines â€œseeâ€� your site, and are the only way to identify critical crawling, indexing, and ranking issues with your site(s).Itâ€™s important to note that the search engines make no claim to giving full, complete, or accurate data on what they report. You should only use these tools with this in mind, and in conjunction with the other methods you use to track search and siteÂ performance, such as site analytics and the SERPs (Search Engine Results Pages) themselves.A significant benefit for those who manage more than one site, is that you can add multiple websites to each dashboard; this allows you to remain signed in and switch between your portfolio of sites to view the data. 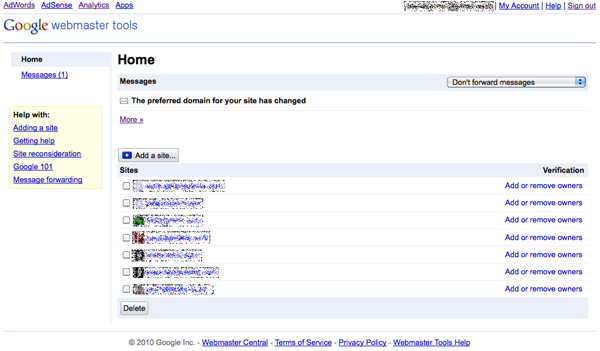 A Google Webmaster Tools account with an assortment of sites is shown in FigureÂ 1, â€œThe Google Webmaster Tools home screenâ€�. Before you can even start to look at the data the search engines have about your site, you must first register the site with them, and verify ownership. This is normally done by either uploading a small file to the root of your web server, or adding a snippet of code on your home page.Google also allows you to verify a site by adding a DNS (domain name server) record to the domain configuration, or by linking with a Google Analytics administrator account. You can see all the available options for verification in FigureÂ 2, â€œWebmaster Tools verificationâ€�.Googleâ€™s Webmaster Tools can be found at https://www.google.com/webmasters/tools/, and Bingâ€™s at http://www.bing.com/webmaster/. The primary task of webmaster tools is to provide information on crawling and indexing. One aspect of search that they provide little information on is ranking.Since Googleâ€™s Webmaster Tools is the reigning leader in this segment, weâ€™ll concentrate on its tool set for the purposes of thisexplanation, but Bingâ€™s dashboard offers very similar insights.So, whatâ€™s gained by registering your site with webmaster tools? 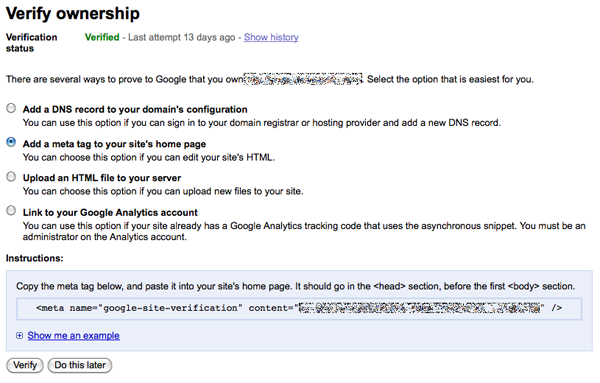 Googleâ€™s Webmaster Tools dashboard is broken down into four sections, so weâ€™ll summarize what each of them contains. This area provides data relating to how both people and search engines find and navigate to your content (links and keywords). Search queries This lists the most popular searches for which your site appeared in Google results, as well as impressions and clicks that were made from those results to your site. Recent improvements in this section include the ability to see this represented in a graph over time, with the average position in the rankings, and specific information on each keyword or phrase, as shown in FigureÂ 3, â€œSearch queries graphed over timeâ€�. How to use: Alongside your analytics metrics and AdWords (if applicable) to identify what terms are driving the most traffic to your site. It will show you whether youâ€™re targeting the right terms, and the CTR (clickthrough rate) will indicate whether your result is performing as it should. This shows what pages have the most backlinks, and allows you to view the sites/pages that contain the link and what anchor text was used. How to use: While most backlinks will be to your home page, you might be unaware of what terms othersites are using to link to you. This will have a direct impact on what terms your site will rank for; identifying the volume of backlinks you have for each of your pages will give you the ability to measure your link-building efforts. This shows how you link to your own content, by counting and displaying which of your pages link to other pageswithin your site.How to use: Deeper content is often harder for search engines to find. If the targeted page is showing a low number of internal links, you can take steps to add additional ones. This area outlines issues that the search engine may have encountered when crawling your site. This shows what pages caused crawling issues: from page not found to server errors that were encountered, as well as what page linked to the error-causing page, and when it occurred. How to use: Server errors such as 500 and 503 should be immediately tested to see if theyâ€™re still occurring, as they normally only show when your server is unavailable or having issues. 404 (page not found) errors are often caused by the pageâ€™s address having been changed without any redirection applied. You should be aiming to have almost no 404 results; in those cases where theyâ€™re inevitable (for example, external sites mightâ€”for reasons unknownâ€”link to a page that doesnâ€™t exist), your 404 page should be designed to ensure that visitors stay on your site. You can do this by including elements such as a site search or links to popular content. This displays three handy graphs, shown in FigureÂ 4, â€œCrawling statisticsâ€�: how many pages were crawled per day, the amount of data downloaded, and the time spent downloading. 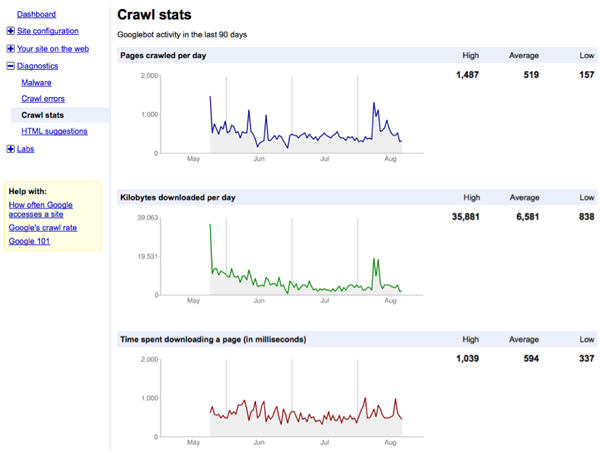 How to use: Itâ€™s important to monitor these graphs, as they indicate activity over time by the search engines. Any sudden dips in the number of pages crawled or the amount of data being downloaded can indicate that recent changes to your site have had a negative impact. The time spent downloading could point to server performance issues that may needto be rectified. This lists issues found relating to your description meta and title tags, highlighting those that are missing or causing duplicate content issues. How to use: If you have reports of a large number of duplicate titles and/or meta descriptions, it means that Google is having trouble establishing a clear picture of what your pages are about. You also run the risk of search engines viewing your pages as duplicate content and filtering them from the search results. You should be using this tool to identify which pages need to have the titles and descriptions rewritten. Another section of the webmaster tools is your site configuration. This let you inform Google of where your sitemap is located, monitor the robots.txt file for your site, have some control over how sitelinksâ€”if applicableâ€”are displayed, and also adjust the suggested crawl rate (use this last one with caution).Probably the biggest benefits to this section are the Sitemap and Crawler access functions.By submitting a sitemapâ€”be it in XML or text-file format, or using RSS/Atom feedsâ€”you gain the clearest picture of how much of your content has been indexed; the dashboard reports an actual figure of indexed URLs that you can compare with the number submitted in your sitemap, as shown in FigureÂ 5, â€œGoogle Webmaster Toolsâ€™ Sitemaps functionalityâ€�. The downside is thatÂ Google Webmaster Tools is unable to tell you which URLs are indexed and which arenâ€™t. The Crawler access function enables you to request that a URL be removed from the index â€”but this does come withsome strict requirements.Hidden in the Settings section of the Site configuration section is the Parameter Handling functionality. This allows youto restrict crawler access to troublesome query-string parameters that may be giving you duplicate content problems, or are meant to provide specific functionality that you donâ€™t want the search engines to be interested in; for example, print versions of pages. While these are the core staple reports, Google Webmaster Tools also offers a Labs section where experimental new features are available. For instance, you can report on how a specific page is fetched by Googleâ€™s spider (known as Googlebot), or graph the time a page takes to loadâ€”as FigureÂ 6, â€œSite performance overviewâ€� shows. Webmaster tools provided by the search engines offer data and insights not possible through any other third-party method, and when tied together with your siteâ€™s analytics tools (and any rank-checking and tracking tools you might be using), youâ€™ll have the broadest picture of your siteâ€™s performance in the search engines. We have only scratched the surface on this topic; there is a huge amount of information provided by the engines themselves, and both Google and Bing offer a community forum where you can ask questions not covered in the support resources.This article was drawn from our latest release, The SEO Business Guide. The whole of Chapter 2,Best-practice SEO, whichÂ includes the content in this article, is available as a free PDF download along with two other chapters. If you like what youread here, be sure to check it out! Yahoo also offers a webmaster dashboard, but with the bulk ofYahooâ€™s search services being taken over by Microsoft Bing, weâ€™llconcentrate on the two largest active webmaster dashboards. Mike Hudson is the in-house web search strategy manager (SEO/SEM) for realestate.com.au. From its head office in Melbourne, he oversees the continuing growth of the company across the network of more than a dozen websites operating in Australia, Europe, and Asia. He is an avid amateur photographer, publishing his images on his personal website at http://seriocomic.com/.